HONG KONG, Sept. 23 (Xinhua) -- The whole line of the Guangzhou-Shenzhen-Hong Kong Express Rail Link has been put into official operation, as the Hong Kong section of the line entered into service on Sunday morning. A high-speed train G5736 left Hong Kong West Kowloon Station at 7 a.m. on Sunday for Shenzhen North Railway Station in Guangdong Province and arrived at the Shenzhen station in 19 minutes. Some 500 passengers, including those from media, came to the Hong Kong West Kowloon Station to take the train. The carriage is quite spacious and the seats can be adjusted to face front or back, according to Mr. Leung, a Hong Kong citizen who are aboard the train. "It (the ride) is quite comfortable. In the future, I would like to go to some places further, like Beijing for example. It takes only a few hours after all," the 70-year-old man told Xinhua. Earlier in the morning, the high-speed train G5711 left Shenzhen North Railway Station at 6:44 a.m. for Hong Kong West Kowloon Station, and arrived at the Hong Kong station at 7:03 a.m..
Hou Ruiting, the captain of train G5711, said the train attendants have all received training on manners and languages to better their services in the ride. "Our attendants have taken special training and examinations of Cantonese and English to cater to all needs," said Hou. A Shenzhen resident, who gave her family name as Wang, took the first train from Shenzhen to Hong Kong, with four family members. "It took only 19 minutes for us to arrive in Hong Kong from Shenzhen. (It's) so convenient. In the past, I had to spend nearly two hours on the trip," said Ms. Wang. "The co-location arrangement is very convenient and I finished all the clearance procedures in a few minutes. Now I can't wait to try the famous Yum Cha (a traditional Hong Kong-style dim sum meal with tea)," said another resident from Shenzhen, who gave his family name as Tian. 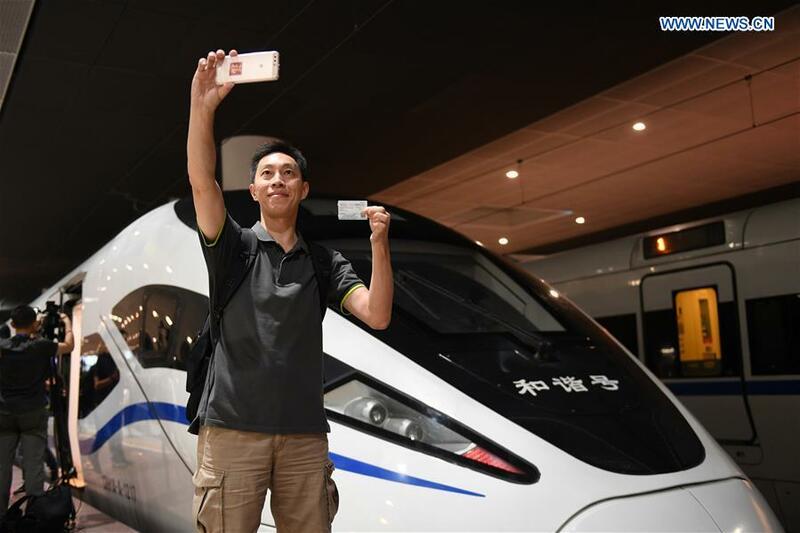 A total of 95 pairs of high-speed trains are scheduled for the service on the line of the Guangzhou-Shenzhen-Hong Kong Express Rail Link on Sunday, including 13 pairs of long-distance trains, according to the China Railway Corporation. Being a key part of China's high-speed rail network, the whole line of the Guangzhou-Shenzhen-Hong Kong Express Rail Link is 141 km long, including 115 km on the mainland and 26 km in the Hong Kong Special Administrative Region. It will offer direct rail services between Hong Kong and 44 destinations on the mainland, involving cities like Beijing, Shanghai, Shijiazhuang, Zhengzhou, Wuhan, Changsha, Hangzhou, Nanchang, Fuzhou, Xiamen, Shantou, Guiyang, Guilin and Kunming. During the initial operation period, the numbers of trains in operation will vary with demands on work days, weekends and peak time. Up to 127 pairs of trains will be in service on a single day with peak demand. From Hong Kong West Kowloon Station, it will take a minimum of 14 minutes to get to Futian Railway Station in Shenzhen, a minimum of 47 minutes to Guangzhou South Railway Station, and eight hours and 56 minutes to Beijing West Railway Station. Chen Xiaomei, spokesperson with China Railway Guangzhou Group Co. Ltd., said the mainland and Hong Kong have built coordination mechanisms covering various aspects such as dispatching and commanding trains, passenger transportation and power supply. Various emergency response plans have been mapped out to ensure safe operation of the Guangzhou-Shenzhen-Hong Kong Express Rail Link, Chen said.